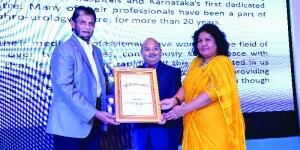 NU Hospital has won the HealthCare Excellence Award 2016 by Brands Academy, for the Best Nephrology, Urology and Fertility Hospital in South India. This year the award ceremony was held in Radisson Blu Hotel at New Delhi. There was a huge participation from the medical sector spread all across India and a number of personalities from different fields were invited to join in the function. The award was received by Mr Narayanamurthy and Mrs Sahana Paul – Operations Manager of NU West and NU South.